If you are an international student and want to have a real Aussie Experience while you live here, then make friends with the locals! This can be difficult sometimes because Sydney is a multicultural and cosmopolitan city, where a large number of students come from all over the world. As an international student many people in your circle are from overseas, just like you, staying in Australia for study or work, so it can be hard to make contact with many Australians. I am doing Masters in Engineering Materials through the School of Material Sciences at UNSW. This is my first semester. 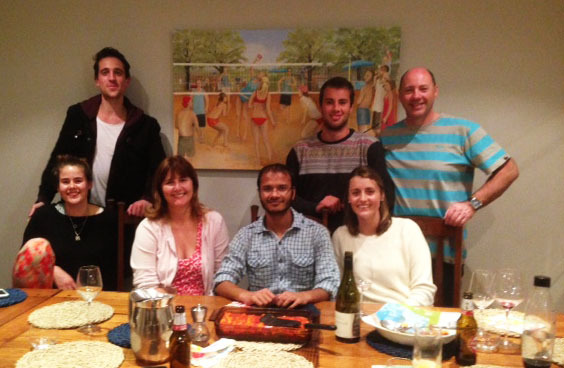 I consider myself lucky and honoured to have been invited by an Australian family for dinner recently. The lady who invited me over for dinner, had read about me in the Sydney Morning Herald. As she was impressed by my academic journey, she contacted the journalist who wrote that article to get my contact details and then contacted me. Everybody in the family was so nice and welcoming. 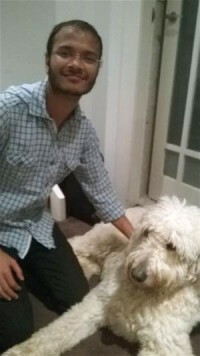 When I reached their home, I was welcomed by a very special member of their family: Max, a big, cute dog. When they discovered that I didn’t know anything about rugby, the sport Australians love (it seems cricket is not the only game Australians love), they told me the name of the rugby team which I should tell people I support if they ask me about my favourite team. It was so much fun. Everybody in their family told me about their studies and work. Looking at my research area (Waste Recycling), they offered to introduce me to some organisations in this area if I was interested. We discussed a lot of fun things as well. The Australian sense of humour is way too different and I couldn’t understand most of their jokes no matter how hard they tried to make me understand. During dinner we had pasta and I got to taste a very, very nice sparkling red wine as well. After that we had fruits with ice-cream and later on we had a very delicious homemade coconut cake. Lastly, we all had sleepy tea. I want to thank them with all my heart for giving me such a wonderful evening to remember and cherish. I hope to see them all again in the future. Moments like these play a huge role in the satisfaction level of international students and give them a chance to live a true Aussie experience.